Not to be confused with Conference South, Big South Conference, or Conference League South. The Southern Conference (SoCon) is a collegiate athletic conference affiliated with the National Collegiate Athletic Association (NCAA) Division I. Southern Conference football teams compete in the Football Championship Subdivision (formerly known as Division I-AA). 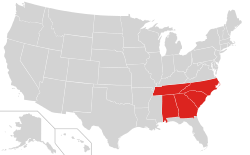 Member institutions are located in the states of Alabama, Georgia, North Carolina, South Carolina, Tennessee, and Virginia. The Southern Conference ranks as the fifth-oldest major college athletic conference in the United States, and either the third- or fourth-oldest in continuous operation, depending on definitions. Among conferences currently in operation, the Big Ten (1896) and Missouri Valley (1907) are indisputably older. The Pac-12 Conference did not operate under its current charter until 1959, but claims the history of the Pacific Coast Conference, founded in 1915, as its own. The Southwest Conference (SWC) was founded in 1914, but ceased operation in 1996 once the Big 12 Conference began play; the Big 12 does not claim the history of the SWC. The SoCon was the first conference to use the three-point field goal in basketball in a November 29, 1980 game at Western Carolina against Middle Tennessee State University (MTSU), where Ronnie Carr shot the historic shot from 22 feet (6.7 m) away and the Catamounts won 77-70. The Southern Conference is considered one of the stronger football conferences in the Football Championship Subdivision and is considered a mid-major conference in basketball. It has also garnered considerable national attention from its recent success in these sports: in particular, former member, three-time Division I NCAA Football champion Appalachian State Mountaineers, who stunned the fifth-ranked Michigan Wolverines 34–32 on September 1, 2007; from the Davidson Wildcats, who reached the Elite Eight in the 2008 NCAA Men's Division I Basketball Tournament by upsetting power programs Gonzaga (a mid-major school which became a power program in the 2000s), Georgetown, and Wisconsin. More recently, the six-time Division I NCAA Football champion Georgia Southern Eagles stunned Southeastern Conference power-house Florida Gators 26-20 in The Swamp on November 23, 2013—the first loss to a lower division opponent in the Florida program's history. In 2015, Furman defeated UCF 16–15 and The Citadel topped South Carolina 23–22 for their second win over the Gamecocks in the past three meetings. The SoCon also frequently sees multiple teams selected to participate in the NCAA Division I Baseball Championship. Talks of a new conference for southern athletics had started as early as fall of 1920. The conference was formed on February 25, 1921 in Atlanta as fourteen member institutions split from the Southern Intercollegiate Athletic Association. Southern Conference charter members were Alabama, Auburn, Clemson, Georgia, Georgia Tech, Kentucky, Maryland, Mississippi State, North Carolina, North Carolina State, Tennessee, Virginia, Virginia Tech, and Washington & Lee. In 1922, six more universities – Florida, LSU, Mississippi, South Carolina, Tulane, and Vanderbilt joined the conference. The first year of competition for the conference was in 1922, effective January 1. The new rules banned freshman play. Later additions included Sewanee (1923), Virginia Military Institute (1924), and Duke (1929). The SoCon is particularly notable for having spawned two other major conferences. In 1932, the 13 schools located south and west of the Appalachians (Alabama, Auburn, Florida, Georgia, Georgia Tech, Kentucky, LSU, Mississippi, Mississippi State, University of the South(Sewanee), Tennessee, Tulane, and Vanderbilt) all departed the SoCon to form the Southeastern Conference (SEC). In 1953, seven additional schools (Clemson, Duke, Maryland, North Carolina, North Carolina State, South Carolina, and Wake Forest) withdrew from the SoCon to form the Atlantic Coast Conference (ACC). The SEC and ACC have gone on to surpass their parent conference in prestige; while the SEC and ACC are considered "power" conferences in Division I FBS (formerly Division I-A), the SoCon dropped to Division I-AA (FCS) in 1982, four years after the top division was split into two levels in 1978. The SoCon became the first league to hold a post-season basketball tournament to decide a conference champion. Although first played in 1921, it did not become "official" until 1922, and in its first few years included teams which were not conference members. Held at the Municipal Auditorium in Atlanta from February 24 – March 2, 1922, the first meeting was won by North Carolina who defeated non-member Mercer in the Finals 40-25. The SoCon Basketball Tournament continues as the nation's oldest conference tournament. The next-oldest tournament overall is the SEC Men's Basketball Tournament, founded in 1933, but that event was suspended after its 1952 edition and did not resume until 1979. With the demise of the Division II West Virginia Intercollegiate Athletic Conference in 2013, whose tournament had been continuously held since 1936, the next-oldest conference tournament in continuous existence is now the ACC Men's Basketball Tournament, first held in 1954. The all-sports membership changed to 10 schools in 2014 following the departure of Appalachian State, Davidson, Elon, and Georgia Southern, plus the arrival of East Tennessee State (ETSU), Mercer, and VMI. The current football membership stands at nine. UNC Greensboro does not sponsor football, while ETSU, which relaunched its previously dormant football program in 2015, rejoined SoCon football in 2016 after one season as an independent. ↑ ETSU had previously been a SoCon member from 1978 to 2005. ↑ VMI had previously been a SoCon member from 1924 to 2003. On January 9, 2014, the SoCon and Atlantic Sun Conference (ASUN) announced a new alliance in lacrosse that took effect with the 2014–15 school year (2015 lacrosse season). Under its terms, sponsorship of men's lacrosse shifted from the ASUN to the SoCon, while women's lacrosse sponsorship remained with the ASUN. Bellarmine, which had announced it would join the ASUN for men's lacrosse for the 2015 season, instead joined the SoCon. The most recent additions to the associate membership came with the start of the 2016–17 school year, when three schools joined for the newly added conference sport of rifle. NJIT !New Jersey Institute of Technology (NJIT) Newark, New Jersey 1881 Public 10,646 Highlanders Atlantic Sun men's lacrosse 2017? Due to space limitations, one portion of Washington and Lee's affiliation history is not indicated in the table. In 1958, W&L stopped awarding athletic scholarships; from then until 1962, it was an independent in what was then the NCAA College Division (which was split in 1973 to form today's Divisions II and III). The Southern Conference sponsors championship competition in eleven men's and nine women's NCAA-sanctioned sports. Five schools are associate members for wrestling. Under a cooperative agreement with the Atlantic Sun Conference, the SoCon began sponsoring men's lacrosse in the 2014–15 school year (2015 season) with three full members (Furman, Mercer, VMI) and four associates (Bellarmine, High Point, Jacksonville, Richmond). Women's lacrosse is sponsored by the ASUN. SoCon men's lacrosse has since added Air Force. Beginning in the 2016–17 academic year, after a 30-year hiatus, the SoCon resumed rifle as its 21st sport. Members for conference competition are full members The Citadel, VMI, and Wofford as well as associate members UAB, Georgia Southern, and North Georgia. The SoCon is one of only two all-sports conferences to sponsor rifle, joining the Ohio Valley Conference. Rifle is technically a men's sport for NCAA purposes, but men's, women's, and coed teams all compete against each other. * = Lacrosse associate members Air Force, Bellarmine, High Point, Jacksonville, and Richmond. NJIT was not officially announced as a future lacrosse member when it joined the Atlantic Sun Conference in 2015, but, once fully established, is likely to join, due to the A-Sun/SoCon lacrosse partnership. Because NJIT's 2016 team is made up entirely of underclassmen, it will continue as an independent at least through that season. # = Wrestling associate members Appalachian State, Campbell, Davidson, Gardner–Webb, and SIU Edwardsville. ¶ = East Tennessee State relaunched its dormant football program in 2015, but played that season as an FCS independent. The Buccaneers rejoin SoCon football for the 2016 season. † = Rifle| is technically a men's sport, but men's, women's, and coed teams all compete against each other. The Citadel and VMI have men's teams, and Wofford has a co-ed team. ‡ = Rifle associate members UAB and North Georgia have co-ed teams. ‡ = Rifle associate members UAB and North Georgia have co-ed teams; rifle associate member Georgia Southern has a women's team. This is a partial list of the last 10 champions. For the full history, see List of Southern Conference football champions. This is a partial list of the last 10 champions. For the full history, see List of Southern Conference men's basketball champions. The Southern Conference split into a divisional format for basketball beginning with the 1994–95 season. However, the divisional format was abandoned beginning with the 2013–14 season. This is a partial list of the last 10 champions. For the full history, see Southern Conference Baseball Tournament. The Commissioner's and Germann Cups are awarded each year to the top men's and women's program in the conference. The Commissioner's Cup was inaugurated in 1970. The Germann Cup, named for former Southern Conference Commissioner Ken Germann, was first awarded in 1987. The completion of the 2013–2014 athletics season saw Appalachian State winning its 33rd Commissioner's Cup and Furman its 13th Germann Cup. 1 2 3 "The History of the Southern Conference". Southern Conference. 2008-06-30. ↑ Stewart Mandel (2007-09-01). "The Mother of All Upsets". CNNSI. ↑ "Curry's sweet touch continues as Davidson eludes Wisconsin". ESPN. Associated Press. 2008-03-28. ↑ David Jones. "Florida falls to FCS opponent, won't be bowl eligible". Retrieved 2014-03-20. ↑ "Preseason Projected Field Of 64". BaseballAmerica.com. Retrieved 2012-03-20. ↑ "Southern Conference Talked By College Men". The Charlotte Observer. February 28, 1921. p. 8. Retrieved August 16, 2015 – via Newspapers.com. 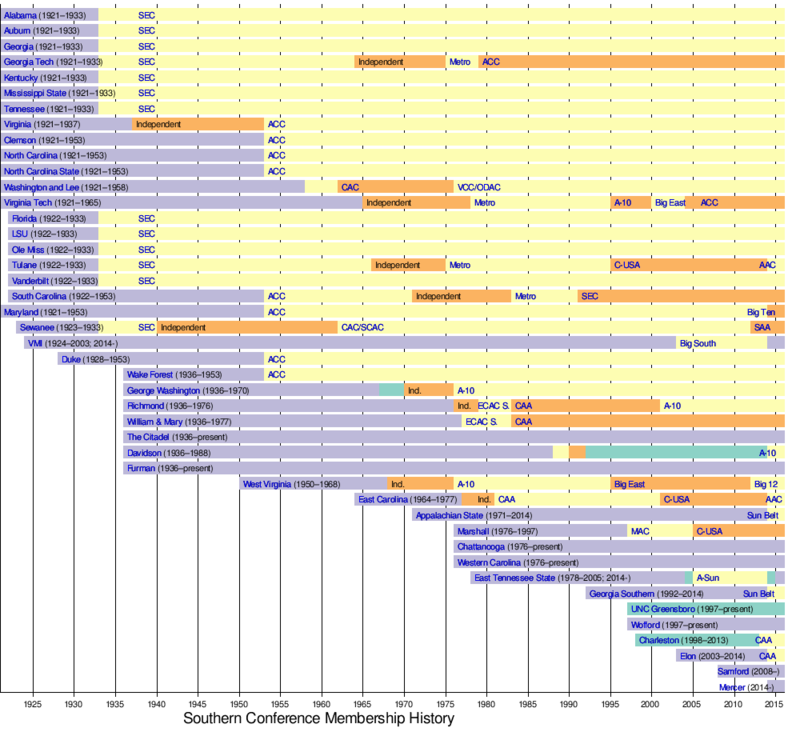 ↑ "Southern Conference, With 15 Colleges as Members, Is Formed At Atlanta Meeting". The Charlotte Observer. February 27, 1921. p. 24. Retrieved August 16, 2015 – via Newspapers.com. ↑ Fuzzy Woodruff (October 16, 1921). "Too Many Practice Games And Too Few Real Battles". News and Observer. p. 15. Retrieved August 16, 2015 – via Newspapers.com. ↑ "Drastic Rules Are Adopted By New Southern Conference To Keep College Sports Clean". The Atlanta Constitution. February 27, 1921. p. 2. Retrieved August 16, 2015 – via Newspapers.com. ↑ "SoCon Tournament Results". Southern Conference. Retrieved August 16, 2015. 1 2 3 "SoCon Welcomes ETSU, Mercer and VMI" (Press release). Southern Conference. July 1, 2014. Retrieved July 2, 2014. 1 2 3 4 5 6 "SoCon, A-Sun Partner to Enhance Lacrosse" (Press release). Southern Conference. January 9, 2014. Retrieved March 31, 2014. 1 2 3 4 "SOUTHERN CONFERENCE TO ADD RIFLE AS 21ST SPORT". Southern Conference. December 9, 2012. Retrieved December 12, 2015. 1 2 Campbell, Gardner–Webb, and VMI compete in the Big South Conference for most sports. ↑ SIU Edwardsville competes in the Missouri Valley Conference for men's soccer and the Ohio Valley Conference for all other sports. ↑ "Southern Conference to add rifle as 21st sport". University of North Georgia. December 9, 2015. Retrieved December 9, 2015. ↑ "Southern Conference Commissioner's & Germann Cups". Southern Conference. 2007-06-04.